Collective Impact Lincoln hand-delivered over 100 written personal testimonials about housing affordability to the Lincoln City Council on March 18. Collective Impact Lincoln hand-delivered over 100 written personal testimonials about housing affordability to the Lincoln City Council on March 18. Next, members of the group – a partnership among Civic Nebraska, Nebraska Appleseed, and the South of Downtown Community Development Organization – and several Lincolnites will testify about the lack of affordable and adequate housing in Lincoln during the Council’s March 25 regular meeting. 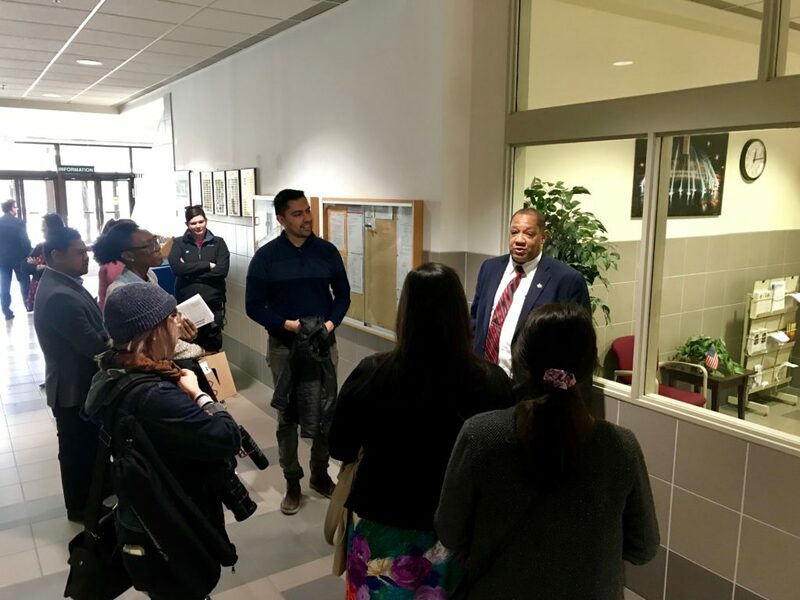 Council Chairman Bennie Shobe greeted Collective Impact Lincoln and Lincolnites after CIL delivered more than 100 postcards to city officials. The availability of adequate and affordable housing in Lincoln has become a crisis. 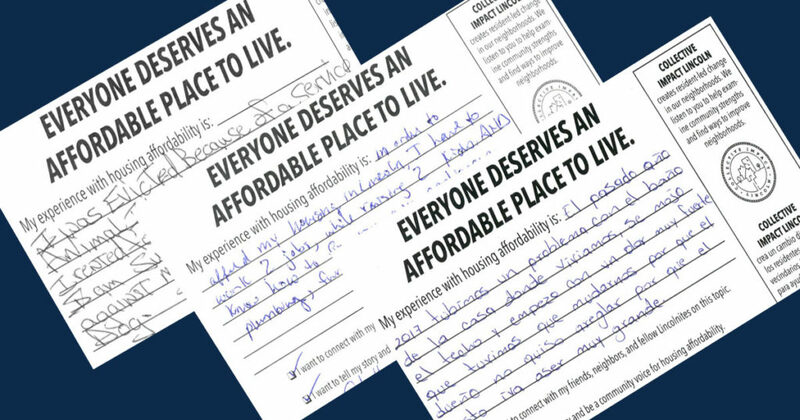 The written testimonials, collected at community events and in the neighborhoods in recent months by Collective Impact Lincoln, show in detail the personal stories and real people affected by this issue. Finding suitable, affordable housing is especially a struggle for low-income Lincolnites, who often must rent. Ninety-one percent of extremely low-income families spend more than one-third of their income on rent, and many are living in unsuitable living conditions. In Lincoln, about 12,000 households are living with housing adequacy issues. Collective Impact Lincoln is sharing their stories to encourage the City Council to act before these issues become worse. Council Member Bennie Shobe greeted the organizers and praised the work Collective Impact Lincoln has done to gather information on the issue. >Code enforcement. Adding additional resources to hire more inspectors to enforce existing housing codes, and reconsider the threshold to investigate complaints. The current system relies on complaints and does not allow for proactive inspection of an interior. A proactive inspection code helps bring buildings into compliance more quickly, can help preserve property values, and can decrease fires. >Rental registry. Create a rental registry to ensure all rental properties are registered with the city, and require inspections. Lincoln needs to be empowered to inspect the interior of rental units as part of a regular system. Collective Impact Lincoln creates lasting, meaningful, resident-led investment and positive change in Lincoln’s core neighborhoods. Through canvassing, community events, and Community Builder Workshops, the partnership helps neighbors examine their communities’ natural strengths and take up new ways to improve. Collective Impact Lincoln focuses on the Belmont, Clinton, Everett, Hartley, Near South, and University Place neighborhoods.